If this sounds like you, you’ve come to the right place. This article is for those of you who already know what intonation is and how to set it on your guitar, but you just can’t get one or two of your guitar strings to intonate properly. If it’s an electric guitar, you’ve moved the string saddle as far forward or backward as it’ll go, with no luck. If it’s an acoustic guitar, you’ve shaped the bridge saddle or tried compensated saddles, but still have a string (or strings) that are sharp or flat. What the hell is going on? 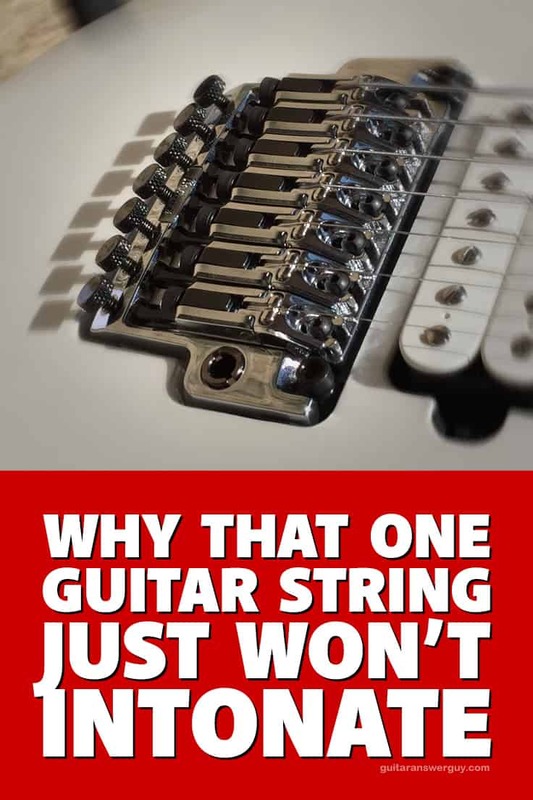 Well, there are a number of reasons that a guitar string can be stubborn. Here I’ll list them all, beginning with the most likely (and easily solved), and gradually progressing to the least likely (and more serious). Look familiar? You’re out of room, and the string is still sharp. Maddening! If you’re struggling to set intonation on guitar strings that are already a few weeks or months old, you’re on a fool’s errand. Intonation should be set with brand new guitar strings. Why? As strings age, intonation “drifts” and you’ll naturally start to hear some out-of-tuneness across the fretboard. If this is the case, don’t adjust your intonation, just change your dang strings. Once you’ve installed and thoroughly stretched your new set of strings, then set your intonation. After that, leave it alone until your next string change. If that didn’t solve your intonation issue, read on. Even with today’s technology and strict quality control methods, sometimes a few bad strings make their way into the market. So, when you have a stubborn string that simply will not intonate, replace that string with another. This will solve your issue most of the time. If not, replace it again. If you still have an issue with that string, step back and ask yourself: did you order all those strings at once, as part of a bulk pack? If so, it’s possible you got a bad batch (the strings were all manufactured in the same run, and therefore all have the same issue). If you suspect this, try a string from a completely different manufacturer. If it still won’t intonate, read on. Remember, your electric guitar’s pickups are magnets, and fairly strong ones at that. If they’re too close to the strings, they can literally pull notes sharp while the string is vibrating. If you’ve got one or more strings that are being stubborn, try lowering your pickups a bit. If your pickup’s pole pieces are adjustable, check those first. It’s possible the pickup as a whole is okay, but you’ve just got one pole piece adjusted too close–causing that one string to be stubborn. 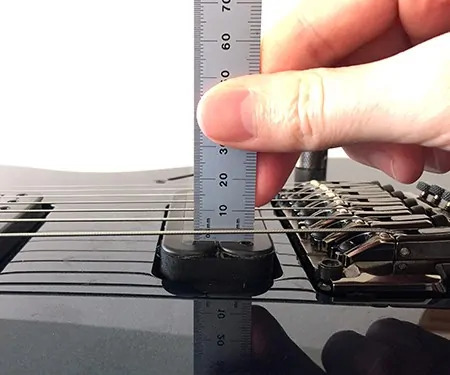 Your pickup’s pole pieces should be about 2mm – 3mm away from the string–as measured with the string fretted at your guitar’s very last fret (22nd or 24th fret, depending on your guitar). Of course, this is just a ballpark measurement; you can adjust to taste. However, get pickups (or individual poles) too close to the strings and you’re bound to have intonation issues. In case you didn’t know, you should be making “setup adjustments” like intonation with the guitar in the playing position. If you’ve been setting intonation–or doing other setup adjustments like the truss rod, string height, etc. with the guitar flat on its back or on a neck rest, then just… stop it. Gravity and other forces will play tricks on you if you make such adjustments with the guitar on its back. You’ll get everything set, then the minute you turn the guitar upright things will go slightly out-of-whack. A guitar on its back is fine for cleaning, electronics work, and other maintenance tasks, but setup adjustments (and measurements) should always be done with the guitar in the playing position. This is one of the hardest things to do: when setting intonation, you should be pressing the string at the 12th fret with the same kind of force you’d use when playing naturally. This is tough because here you’re actually thinking about it, whereas when you’re playing, you’re not. This applies whether you are a heavy-handed player or tend to play with a feather touch. The pressure you use when setting intonation needs to match what you naturally do while playing. For years I set intonation the way most of us are first taught: by comparing the fretted note at the 12th fret with the 12th fret harmonic. Then I heard guitar repair guru Dan Erlewine recommend a different way: don’t use the 12th fret harmonic as the reference note, use the open string instead. In other words, get your open string perfectly in tune, and then see whether the fretted note at the 12th fret is sharp or flat. The same adjustment rules apply, you’re just using the open string as the reference rather than the harmonic. Dan said something about the 12th fret harmonics being unreliable, but unfortunately he didn’t elaborate. Ever since then, I’ve used the open string and fretted 12th fret note to set intonation. No more harmonics for me. You are welcome to continue using the 12th fret harmonic if you’d like. I think it’s perfectly fine in most cases. I’m just throwing this one out there for those of you frustrated with intonation issues. The Peterson StroboPlus HD is an excellent, inexpensive strobe tuner that costs less than many guitar pedals. Standard guitar tuners are fine for general tuning of open strings, but aren’t accurate enough for setting intonation. You need a strobe tuner accurate to within +/- 0.1 cents or better. 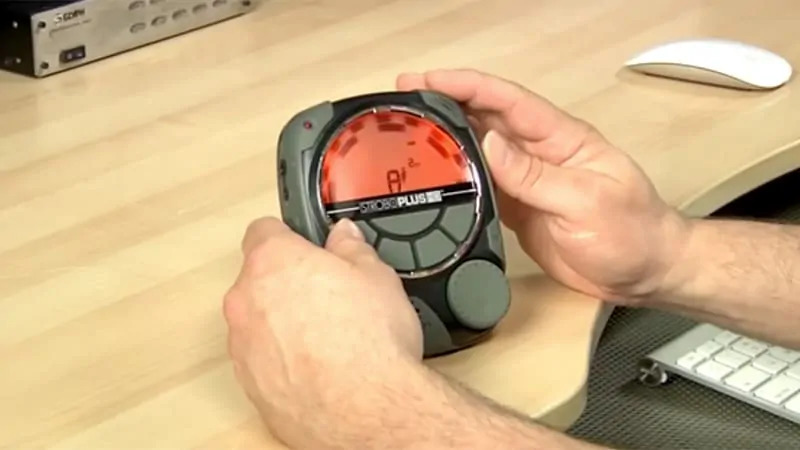 Check your tuner’s specs, and if they don’t show you the actual accuracy numbers and simply describe it as “highly accurate”, “precise”, or something similarly vague, then you need another tuner specifically for setting intonation. I recommend the Peterson StroboPlus HD (pictured above) or its sibling, the Peterson Stomp Classic. 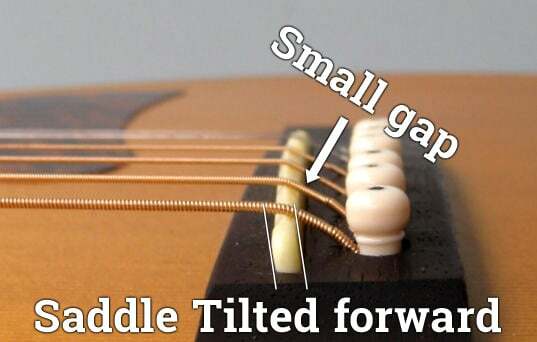 On acoustic guitars, and other guitars that have a single bridge saddle made of bone or plastic, the saddle should fit snugly enough in the slot that it can’t tilt forward or backward. In fact, it should take a decent bit of effort to get it in and out of the saddle slot. If the nut slot is too loose, the saddle will tilt forward (toward the headstock) when you tune strings up to pitch, and this tilt will throw your intonation off. Maybe you got your intonation set properly at the 12th fret, but you find that notes and chords played in the first few (lower) positions are always noticeably sharp. This is usually a sign that the guitar nut is too high. When doing a setup, it’s not uncommon (for those who are inexperienced) to forget or simply not know that setting the nut height is a part of the whole operation. 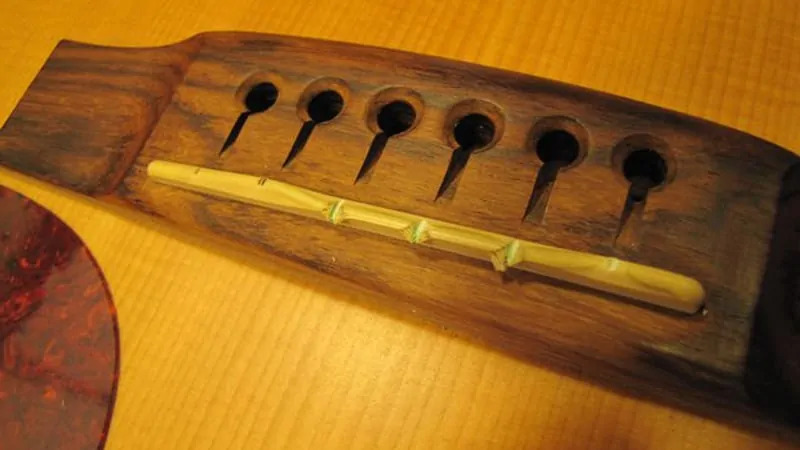 If the nut is too high, the notes closest to the nut can be sharp when fretted, regardless of how precisely you set the intonation at the 12th fret. Having too much relief (forward bow) in your guitar neck is a double whammy: not only will it make your action excessively high, it actually shortens the physical length of the string. These two factors together will cause your fretted notes to be sharp at the 12th fret, no matter how much you try to compensate at the guitar’s bridge. If you just have excessively high action in-general, your fretted note at the 12th fret will always be sharp compared to the open string. No matter how far backward you move your guitar’s saddles, you just can’t get that fretted note in tune. Of course, if your action is so high that you can’t get the strings to intonate properly, then the guitar is probably unplayable anyway. 13. Your frets are excessively worn, flat, dented, etc. Overly flat frets can cause intonation issues. Frets should be round and smooth on the top, and the string should only contact the fret at a very small point at the tip (crown) of the fret. If the tops of your frets are too flat, dented, or you just had crappy fretwork done by a bad guitar tech, you can have trouble setting intonation. If this is the case, you’ll probably have other issues too, such as fret buzz or notes fretting out. Now we’re getting into the “rare but catastrophic” territory. You’ll usually only encounter this one on really cheap guitars or on used guitars where bad repair work was done. Rarely will a high quality guitar make it out of the factory with a bridge slightly out of place. However, I’m mentioning it because it’s something you want to be on the lookout for when buying used or “factory second” guitars. A bad repair job, where the bridge was placed just a tad too far forward/backward, can make that sucker impossible to intonate correctly. If this turns out to be the case, your only option is to have the bridge removed and relocated into the proper position. How expensive and difficult this is depends on what type of bridge it is. Just as a bridge can be placed incorrectly–too far forward or backward–so can the nut. Again, it’s rare, but it is one possible cause for severe intonation problems. Again, not something that is usually seen on higher quality guitars that are brand new from the manufacturer, but be on the lookout for this if you bought your guitar used or as a “factory second.” Depending on what kind of guitar and nut you have, this one can be a little easier to fix than an improperly placed bridge. This one’s extremely rare and highly unlikely. It goes without saying that if your frets are slightly off, you bought a lemon. There’s no way you’re going to get this sucker to intonate properly unless you do major surgery. You’d need to pull all the frets, fill the old slots, re-cut new ones, and completely refret the guitar. Another option is to buy a whole new neck from the manufacturer or a company like Warmoth Custom Guitar Parts. However, neither of those options is realistic for a cheap guitar, as both will likely cost far more than the guitar is actually worth. Just about as rare and unlikely as having frets in the wrong spots, if your neck was installed too far forward or backward in the neck pocket, setting intonation can be impossible. The good news here is that, if it’s an electric guitar with a bolt-on neck, this one can be easier to fix by a good repairperson. If it’s an acoustic, set neck, or neck-through guitar, maybe not so much. Depending on the exact nature of the problem, a pro might be able to fix this one for you, but it could be pricey. Take it in for an evaluation and estimate if you suspect this is your issue. Unless you’ve installed true temperament frets, you will never have perfect intonation on every note across the entire fretboard. It’s just the nature of playing an even-tempered instrument with fixed, straight fretwire. This is exactly why fretless instruments exist: so that the player can place their fingers in precisely the right spots and create perfectly intonated notes (which is a difficult skill to master by itself). So, get your intonation set correctly, and accept that certain notes and chords will be more in tune than others. Where do you spend most of your time on the fretboard? Are you a campfire-chord strummer who rarely ventures above the 5th fret? If so, then it may make more sense for you to use the 3rd or 5th fret to set your intonation. If you’re a shredder who’s usually higher on the neck, then it may make sense to use the 7th, 12th, or even 15th fret to set your intonation. See where I’m going with this? When you’re tuning, no doubt you’ve noticed that when you initially pluck (attack) the note, it jumps up then comes back down (decays) and stabilizes. Well, the same thing happens when setting intonation. When you pluck your reference note at the 12th fret, it’ll initially jump high then come back down. Which should you use to set your intonation? The answer is: it depends on what playing style you use most of the time. If you primarily play fast and rarely hold long, sustaining notes or chords, set your intonation to the “attack” note. Just be aware that, on the rare occasion you decide to hold a long note, it’ll drift a bit flat. On the other hand, if you tend to play slower or like to hold/sustain notes and chords longer (or just let them ring out), then consider setting your intonation to the “decay” note. Okay guitar gurus, these are all the reasons that I know about. However, I’m not an encyclopedia, so if you know of any reasons that I’ve left off the list, let me (and everyone else) know in the comments below. I have a question about string gauges. I have 2 seven string guitars where I seem to have a problem with tuning stability with the low B string. When I have a set of strings with 10-56 both my guitars sound great in tune (I tune down half a step to A#….now the problem is, when I put on a set of strings with 60 or 62 or even 64. The low B string sounds very “unstable” like it’s out of tune with itself!? Also, when I pluck ONLY the low B string it sounds like it has this “vibration” sound to it, like it’s out of tune with itself (yes I lowered my pickups) same result….all the other strings sound fine with power chords but not the low B, it sounds completely out of tune with power chords….I then put on a 0.74 on the low B and then it was stable!?!?. It’s the same problem on both my guitars! I have a schecter loomis with a new nut installed by a pro and a custom made guitar with Zero fret install and Evertune. So I don’t think that the nut is the issue. I have tried to put on new strings 3 times with a 0.64 with the same result! ?….056 and 074 the tuning and power chords sounds perfect! I’m really confused! Hi Claus! I’m afraid this is one I probably can’t explain, but just know that you’re not alone when it comes to mysterious, unexplainable string issues. I had a similar string-related mystery a couple years ago when I bought a new 7-string which has a 26.5″ scale length (an Ibanez RGD3127). I own many Ibanez 7’s, but this was my first with a 26.5″ scale length. All my other’s are 25.5″. I’ve always used Ernie Ball Cobalt 9 – 52 strings on those, and I love ’em. However, when I put those strings on my new RGD3127 I got a weird and very annoying “metallic” pinging/ringing sound whenever I was doing palm mutes and chugs. I dampened everything–trem springs, headstock strings, etc. No effect. It was just some weird, mysterious, metallic resonance. After much investigation and being unable to find anything wrong with the guitar itself, I changed to standard (non Cobalt) Ernie Ball strings in the exact same gauge. The sound disappeared. Then, I put a brand new/fresh set of Cobalts back on… and the sound was back. To this day, I have no idea why, but my Ibanez RGD3127 can’t use Ernie Ball Cobalts, 9-52. No luthier I’ve talked to has been able to explain it either. There’s some mysterious combination of factors, when combined with the Cobalt strings, the produces that odd, horrible-sounding metallic resonance. You and I would probably need and engineer or physicist to explain these things to us. Or, perhaps there’s a luthier out there reading this that can chime in and shed some light on what’s happening here. Sorry I couldn’t be more help on this one. This is indeed an odd one. I’ve never come across this but if I had to guess I’d say it could have something to do with resonance of the saddle material in combo with the strings. A lighter mass might not resist the vibrations as well as a heavier mass and thus transfer the forces into the body creating the metallic tones–an engineer might be better able to explain this. Also, has anyone contacted the string manufacturer to pose the question to them? Great article–I was pleased to see you covered all the things we commonly have encountered as well as a few remote but rare possibilities. One thing that I still see often is that people will down tune to pitch which is a “no-no” since the slightest amount of string slackness will throw off the tuning after you start to play the guitar, or if you strike a string more aggressively. So, if you try to intonate a string after down tuning to pitch, you’ll be frustrated. Checking the guitar nut carefully to see if the point of string contact is correct is a common thing I’ve come across too. Just like a fret top that is not contacting the string at the centre of the fret, we don’t want to see a nut slot that creates a contact point that is not at the front of the nut. 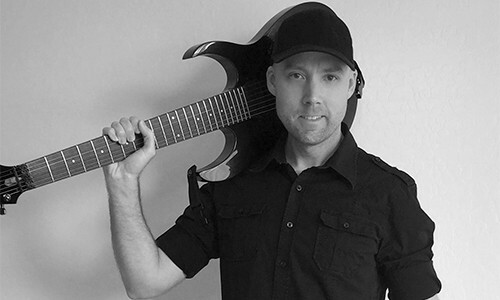 Hey, Guitar Answer Guy, I have a problem with the A string on my 2003 Schecter diamond elite (set neck, tune o matic bridge) and the problem is it won’t intonate. I’ve got all the other strings, as intonated as possible, but the A string is always about 6 cents flat and moving the saddle doesn’t change anything. My neck angle is quite flat and my action is low. As far as I can tell, it’s not the fault of anything you outlined in the article. It’s not the strings (did it with old strings, does it with brand new DR Black Beauties) and it’s not the nut slot (was previously fine). It goes flat on and after the 5th fret, so that would lead me to believe it is a truss rod issue (as the truss rod only affects, roughly, the frets from the 5th to 12th frets) but it’s only affecting the A string. Could me neck be warped? Wouldn’t that affect more than 1 string? Also, it doesn’t appear to be warped (frets all look parallel when I look down the neck). I’m really at a loss… My bridge needs to replaced but I don’t think it’s the culprit – all of the set screws work right, no overt damage to saddles, the retaining wire is bent and does rattle but still holds the intonation screws in place. It doesn’t look like the bridge or tailpiece are installed in the wrong place, although the tailpiece does seem to be leaning forward a tad bit – the screw mounts (that are installed into the wood) appear to be lifting up and pulling out of the guitar (about 2mm on the backside of tailpiece) when strings are tuned to playing tension. I knocked them back down into place with a rubber mallot and the problem seems to persist. All I can think is that my neck is slightly warped, towards the low strings and that’s causing my intonation issues. It’s a big enough issue that I can’t play through it (my ears can’t ignore the flatness of the notes). Thanks in advance for any insight you may be able to provide. Hi Rob. It’s nearly impossible to diagnose something like this without actually inspecting the guitar, but maybe I can at least help you rule out a few things. I don’t think you neck is warped. You’d be able to see a twist in it when sighting down the neck (viewing it from the tip of the headstock toward the body), and you’d have more issues than just an A string that won’t intonate. My guess is that it has something to do with the bridge issues you mentioned. None of that stuff should be happening. That bridge should be solid, not tilting, and certainly not pulling out of the body in any way. Any movement or imperfections there can cause intonation issues (and sometimes only on a single string). At the beginning, you said that you don’t think your intonation issues are the fault of anything in my article but, honestly, unless you’re a luthier or professional tech, you might not be able to detect a lot of these things (fret issues, nut slot issues, etc). If you’re certain it’s not just a bad string (I’ve had to go through 2-3 brand new strings on some occasions to finally get a good one that’ll intonate), then you might want to take the guitar to a pro. Let them inspect the guitar and get to the bottom of what’s going on. Hi, I think I fall into the #10 cause. My intonation on the 12th fret is correct, but the lower frets are way off, up to 7 cents. I live in Japan and don’t know of a good tech. It’s a new PRS SE. Hi Robert. Deepening and re-shaping nut slots is something you can do yourself, if absolutely necessary. I usually don’t recommend it though–because I’m not an advocate of people “learning” serious guitar work on their main guitar. However, if you think you want to tackle it yourself, just be sure you take the time to research, learn the correct technique, and use the right tools. 1. Do you think the nuts being set too high is a good reason why all 1st to 4th frets on all 7 strings are sharp?…true even if I play the strings lightly. Above fret five, or so, they start playing accurately. Intonation between 12th fret harmonics (plus open strings) and holding the 12th fret is fine. 2. (not really a quest) I’m not sure I can find a trusted tech here in Japan. I don’t have the language skills to fully express myself, nor understand the tech. For one thing, I live in a rural area. 3. If the nut does need filing and I attempted myself, I think through Amazon.com, I can get the tools. Do you know of some good youTube videos or text I can get a hold of? The guitar is a new PRS custom SE. 1. 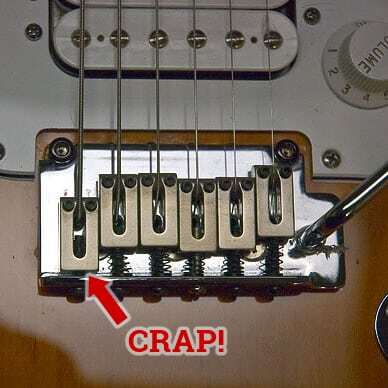 Though it’s difficult to diagnose any problem without actually inspecting your guitar, I’m speculating that yes, your nut being too high could (and would) definitely cause those lower frets to play sharp. The nut is the #1 thing that gets rushed or overlooked during final QA before a guitar leaves the manufacturer. 2. I lived in Japan for 3 years (in Misawa), so I totally understand how difficult this can be. I never truly learned to speak Japanese, just bits and pieces, but I got very good at using sounds, hand gestures, body gestures, etc. to communicate. Most people could understand what I was trying to say, and a guitar tech or luthier would definitely know what you’re trying to say if you pointed at the nut and then let them play/measure it. Of course, I understand that this doesn’t help you much if you don’t even have such a person anywhere near you. What about your nearest cities? 3. To be honest, there are so many YouTube videos out there that I’m not sure which one (or ones) to recommend for nut work. However, I can confidently recommend the book “The Guitar Player Repair Guide” by Dan Erlewine. Now in its 3rd edition, that’s the book that started it all for me, and I still refer to it to this day. Before you go and buy any tools (you can sometimes get by without fancy tools), I recommend buying that book and reading the sections on nut-making and modification. That book contains a lot of other info that you may not want or need right now, but you might some day. 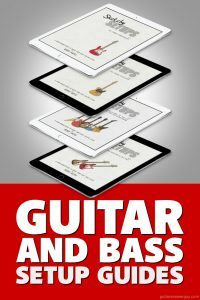 It covers just about everything you’ll ever need to know as a guitar owner. Thank you so much for spending the time with me. I did, indeed, find a great guitar mechanic. It was a real challenge to find his shops down the narrow streets, especially not knowing that the last 70 feet, or so, was a walking path. It turned out it was a high ridding nut. I got to stay and watch him work. Very enjoyable afternoon. Even so, I’m will be looking into purchasing that book. Be well and have a great holiday season. That’s great news! I do remember the narrow streets, and how those little shops (where highly skilled craftsmen/women worked) were sometimes hidden down alleyways. Not knowing the language very well, sometimes you just have to explore the town a lot and hope you discover them. Happy holidays to you, and hope you enjoy playing that PRS SE a little more now that it plays in-tune. You said strings stretch but this is not true according to manufacturers. They only seat themselves in. I have locking tuners and the strings are always in tune from the day I install them. The is not even one wrap around the tuning peg. I don’t care whether you choose to call it “stretching” or “seating”… that’s up to you. I call it “stretching” because that’s the physical action I’m performing on the string. Whether or not the metal is actually stretching, well, I’ll leave that up to all the physicists and engineers. Great article! I’m positive that the fault lies in the string. Will swap it out later for a new one. I’ll never order these cheap sets of strings ever again; too much trouble to save on a few bucks. Let me know how it goes George, and if you still have problems check back in and maybe we can try to troubleshoot. A bad string (or a bad set of strings) is always the 1st thing I suspect when I have intonation issues. And 99% of the time it does turn out to be the strings. 1. Has this always been an issue on this guitar, or did it just start happening at some point? When? 2. What kind of guitar is this, and what kind of bridge does it have? 3. How old is your current set of strings? 4. What is the brand/gauge of strings you’re using? 5. Have you always used this brand/gauge of strings, or did you change recently? You’re attempting to fix this in the right way–by moving the saddles forward. However, there are a number of things that could be causing this, so knowing the answers to the questions above might help me diagnose the problem. Usually, when all strings are too flat/sharp despite all saddles being at their max travel, it’s time for a new set of strings (always set intonation with brand new strings). The strings could simply be old, or it could be a bad set of strings (it happens). I have an early 70s Kay Les Paul copy that I’ve been wrestling with intonation problems for since I bought it (used). The problem is with open chords at the first position. For a long time I just tuned it so that E and A were good and that way I could just use barr chords for all my other chords. Then one day I put a capo on (I never normally use one) and I found that I could play open C, G, and D shapes in the first position and they were pretty much in tune. Since then I’ve been just keeping a capo at the first fret (but still tuning the guitar so that it’s EADGBE open. But I’ve started wondering if the nut could be the whole problem? I honestly don’t know why they stopped using zero frets on guitars because that would have probably solved the problem, but anyway, do you think a new nut, properly set up could fix the issue? Mark, it’s very possible that it’s a nut issue, or that the nut is at least part of the problem. However, it’s hard to know for sure without inspecting your guitar in-person. You might look into something like a compensated nut. Even if the nut isn’t 100% the problem, a compensated nut can often take care of the issue–at least enough that it pleases your ear. Hi Christofer. Can you be a little more specific? Suffice to say, if you’re having electrical issues it would be best to just take your guitar to a tech and avoid the headaches of freaking out and trying to fix it yourself. It would be difficult for me to diagnose and then talk you through correcting a possible wiring issue over the internet, but get back to me with more specifics and I’ll try to help. I am loosing my mind. I have a hard tailed strat with a block. New strings and setup today. I tune my 6th string low E and fret at 12, it is about 3-4 cents sharp. I then turn the adjustment screw on the bridge clockwise, moving the saddle back to lengthen the string and the damn thing goes sharper so it is a never ending circle of getting nowhere-what gives? Sorry if I’m asking an obvious question, but are you re-tuning the string after you make an intonation adjustment? Whenever you move a saddle, you’re effectively throwing the guitar out of tune (in your case, pulling the string sharp, just as if you turned the tuning peg), so you need to retune the guitar after each minute adjustment. After you’ve retuned, check intonation again. If it’s still wrong, adjust the saddle a bit more. Retune. Check intonation again. Wash, rinse, repeat. If you max-out the saddle’s travel and still can’t get that low E to intonate, then something’s probably going on related to numbers 2 – 7, or 13. If this was never a problem before and only just started happening with this string, be sure it’s fully stretched. If it is, consider trying a different string–you may have a bad one. My intonation is sharp by about 2-4 bars on the tuner on almost every string, even when I max out the saddles. I don’t know if this variance is commonly considered to be the norm, or if you should expect closer intonation at the 12th fret. Can anyone advise? If you’re saying that you’ve got your saddles completely maxed and the intonation at the 12th fret is still sharp, then there’s another problem. Be sure you’re setting intonation with a brand new set of strings that have been fully stretched. If you’re not using new strings, that could be your problem. I’d really have to inspect your guitar myself to diagnose what’s actually going on. Damn man, this is a remedy for all those guitarists with a bit too precise hearing ( such as me : P ) Thank you so much ! Yep, I’m one of those too. Even when I get intonation set perfectly at the 12th fret, I can hear all the other places on the neck where notes are slightly out of tune. I’d love to get true temperament frets, but they’re just too expensive for me. Thank you so, so much!! The 12th instead of 12th harmonics saved my life. After a long struggle, my guitar is finally in tune. I had to swich the saddles on my tune o matic bridge. That’s great news Arthur! Those harmonics can be tricky, so I always use the fretted 12th fret note now when setting intonation. Hi Rohit! If your tuner is showing “A” when you’re trying to tune your G string, then you’ve gone a whole step too high. Simply tune the string back down to G.
Any guitar can play in tune with a custom compensated nut. I have proof. Right, but the point is, can you, would you share? Also, I have heard the heavier the string gauge, may affect the intonation. I have started trying some flat wound strings and wonder if they may change the settings as well… Thanks for an extremely well done article. Specific intonation solution – might help someone – my guitar teacher / composer / old rocker told me he always replaces the G string in the sets he buys with a wound G string. Oddly I was having a similar problem keeping my G string in tune – replaced it with a set that had a wound G string, reset intonation and frustration is gone. Thanks for that suggestion Joe–I’ve indeed heard of this solution for the pesky G string. I’ll consider adding this one to the list.